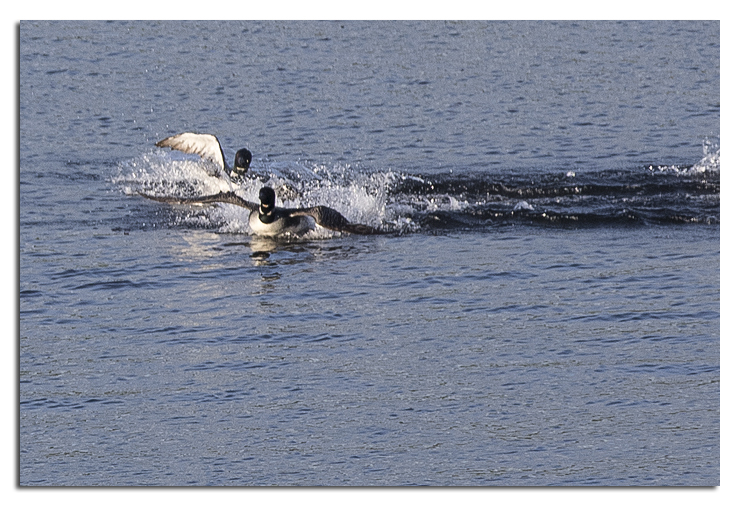 Loons may get all the attention this time of year, but there's plenty of other action taking place around the lakes. One recent morning I heard the sound of an attack on an old rotting snag, and I was able to track down the source. Pileated woodpeckers are one of the more impressive New England birds and their populations have been growing since agriculture was widely abandoned in the late 1800s. As the forests have regrown and become mature, more trees are dying, providing food sources for many animals. It's important to wildlife to let dead snags stand if they're not a danger to homes or people. The goldenrod spider - so named because it's often found on goldenrod where its color lets in blend in - is one of my favorites; it should be one of yours too as it is harmless to people even if it does look a little bit evil. But it is an enemy to wasps which are its favorite food. 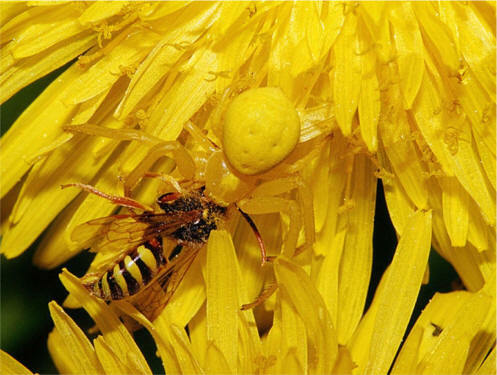 It also doesn't make webs except to hold its eggs - it attacks its prey directly by simply hiding in plain sight. And it has a pretty amazing property in that it can change its color from yellow to white depending on the flower on which it's hunting, waiting for its prey to arrive. 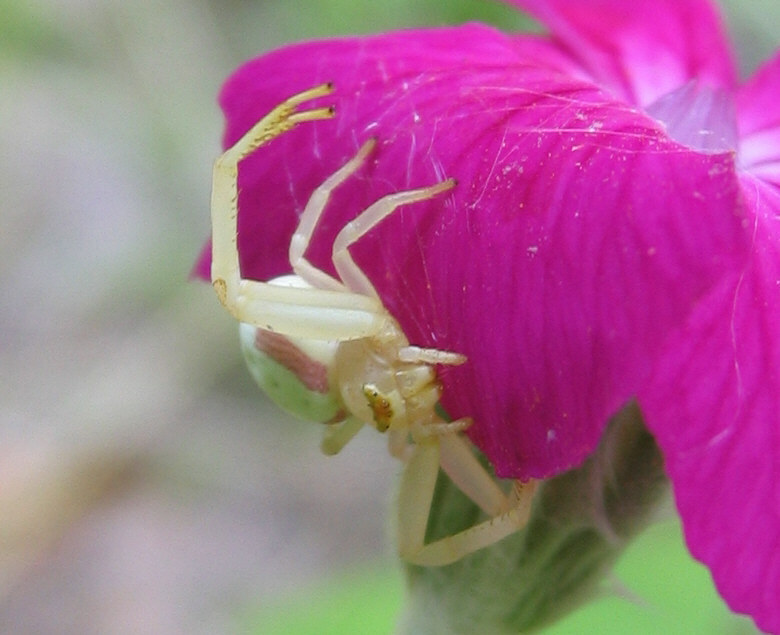 Here's one I saw a few years ago on a magenta-colored flower, where it had turned itself white with pink stripes. Look carefully at your flowers and maybe you'll find one. While you're searching, you're bound to see other insects taking advantage of pollen and nectar, as well as the carnivorous insects preying on them. Even without living creatures, you'll find plenty of beauty in New Hampshire's native summer blooms. 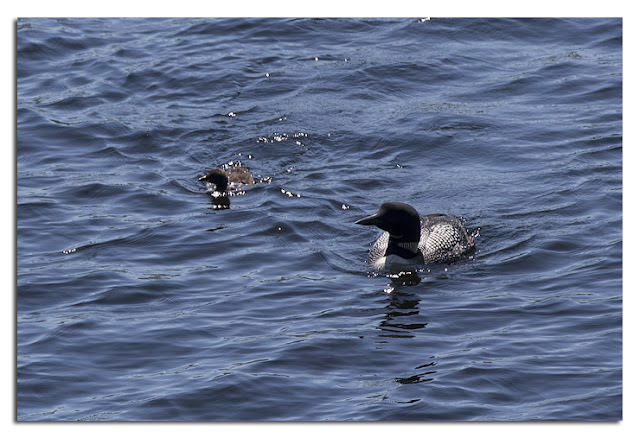 Now the update on the loons, and there is sad news to report. The younger of the two loons chicks has been lost, apparently to a hawk. On Thursday morning we witnessed a hawk attack on Sam, followed by awful loon calls. But after a few moments of fear from not seeing the little chick, out popped Sam from behind a parent! As of yesterday, Sam was still alive and well, though the battle is far from over. 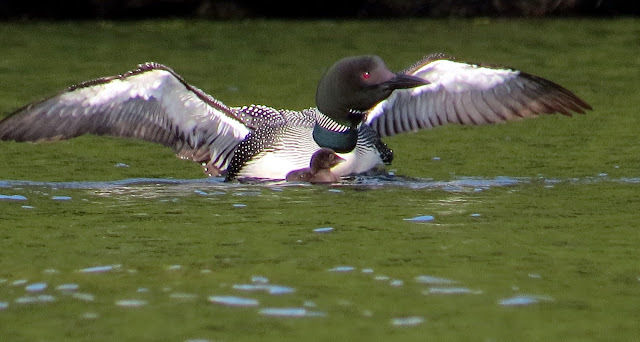 Amy Wilson observed a long defense of Sam from a rogue loon that thankfully ended with the attacker being driven off. Sam's parent fighting off an attacking rogue. Photo by Amy Wilson. But it will undoubtedly be back. Sam in a quieter moment. Photo by Amy Wilson. Later that day there was a report of another hawk attack on the younger Justintime, and apparently little Justin' wasn't as fortunate as Sam. Justintime hasn't been seen since, including during a thorough search by the Thorpe's on Saturday for the Loon Preservation Committee's annual loon census. And the loss wasn't due to lack of trying by the parents, as they were doing their best to protect their offspring. Justintime being well guarded by a protective parent. Photo by Debby Crowely. So here is one more look at Justintime, with many thanks to Debby. 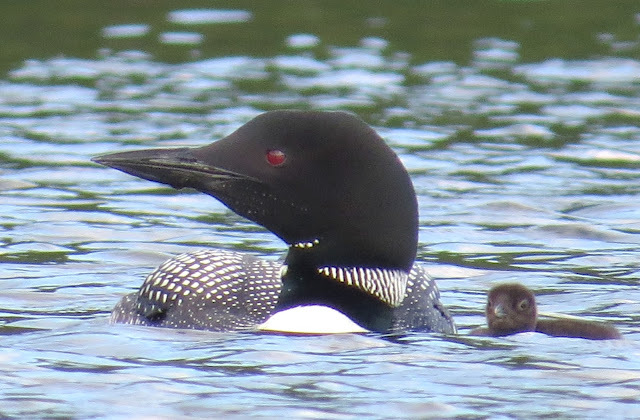 It's a tough life for New Hampshire's loons, but I can understand why they choose to reside here in spite of the difficulty - it's such a beautiful place to live.